The village of Dalyan occupies a unique corner of south-western Turkey, where nature and history blend together in an area of outstanding beauty. The heart of Dalyan is the Dalyan River, overlooked by the stern facades of Dalyan’s famous rock tombs. This ever-changing waterway links the wild majesty of Lake Koycegiz, with the archaeological splendour of Kaunos, a little-visited yet utterly evocative ancient site,and the unspoilt sands of Iztuzu Beach, one of the last protected Mediterranean breeding grounds for the endangered Loggerhead sea turtle or 'Caretta Caretta' as it is known in Turkey. The village itself has retained much of its Turkish character, despite the influx of tourism. Cars share the streets with wayward chickens, cows amble homewards alongside sun-bronzed visitors and strangers are greeted with tea and ‘hos geldiniz!’ – the Turkish for welcome. Farmers from neighbouring villages converge at the saturday market to sell their pungent goat’s cheese and delicious, misshapen tomatoes alongside vendors of soft cotton towels, aromatic spice and ‘real, genuine fake’ designer jeans. Overlooking all this frenzied activity, the stern facades of Dalyan’s famous rock tombs gaze down across the river, as they have for the last two and a half millennia. These astonishing structures were built by the Lycians, a pre-Roman people who left their past scattered over much of Mediterranean Turkey, from their capital at Xanthos to far-flung outposts such as Dalyan. Their neighbours were the Karians, who founded the nearby city of Kaunos. A 30-minute walk along a country lane will bring you to this understated yet haunting site, with tortoises sheltering in the foundations of a Roman bathhouse and goats drinking from the pools of temple ruins. This is no Ephesus: Kaunos is still so little visited that you can search in peace for shards of ancient pottery or stand alone at the top of the acropolis to gaze at the panoramic view. Equally delightful is a cruise across Lake Koycegiz where dramatic mountains encircle the cool clear waters, which invite you to leap in and join the fish. You can do as the Turks do and visit the hot springs to submerge yourself in piping hot water, thick with the aroma of sulphur and said to chase away most known ills. Or do as the tourists do and slather yourself in mud at the famous mud baths – in theory this will knock 10 years off your age, though the rejuvenation probably has as much to do with the laidback atmosphere of Dalyan as with any secret ingredient in this soft grey goo! The lake is stunning by moonlight; but breathtaking in the early morning when birds skim the surface, fish leap in the sunlight and the river turtles come out to play. Wherever you go you’re surrounded by nature – from the river turtles that come bobbing up to your boat for chunks for bread to the kingfishers which dart through the reeds in a brilliant flash of colour. If you’re at all interested in birds, come in the spring when be-winged visitors from Europe, Africa and Asia stop in Dalyan on their annual journey of migration. An hour downstream on a slow boat, past Dalyan village and through the reed-fringed delta, you arrive at Iztuzu Beach with its rolling dunes and gently lapping blue sea. It’s hard to believe that these three miles or so of soft sand have avoided the scars of development – yet there are no permanent buildings to deface what many consider to be the best beach in Turkey. Iztuzu beach is now listed in the worlds top 6 beaches. For this we must thank the loggerhead sea turtle (Caretta caretta) for it was the persistence of this mysterious creature in always returning to Iztuzu to lay her eggs which led in the 1980s to a campaign, backed by David Bellamy, to assign a protected status to the beach. Today, certain areas are cordoned off in the summer to protect the nests and the beach is closed at night while the turtles do what they have always done. Still, it’s possible to spot the tracks of these creatures on the beach and a few visitors have been lucky enough to spy a turtle bobbing majestically in the sea. Take a stroll along the sand and you’ll come to another, very different beach, shaded cliffs, dotted with trees bent over by the winter winds and backed by a salty lake. This is where the local people come on Sundays, bringing children and grandparents, tea sets and rugs on the back of the family tractor. The journey back is a scenic meander through mountains, on a road lined with oleander bushes which give way every so often to reveal yet another glorious view of the Dalyan delta. You might think that somewhere as special as Dalyan must be hidden away at the end of a long, dusty bus journey, demanding hours of travel on twisting roads. Yet it’s just 30 minutes from Dalaman Airport (with a regular influx of European charters and scheduled flights from Istanbul), making it one of the most easily-reached, as well as one of the most rewarding, of all the Turkish destinations. 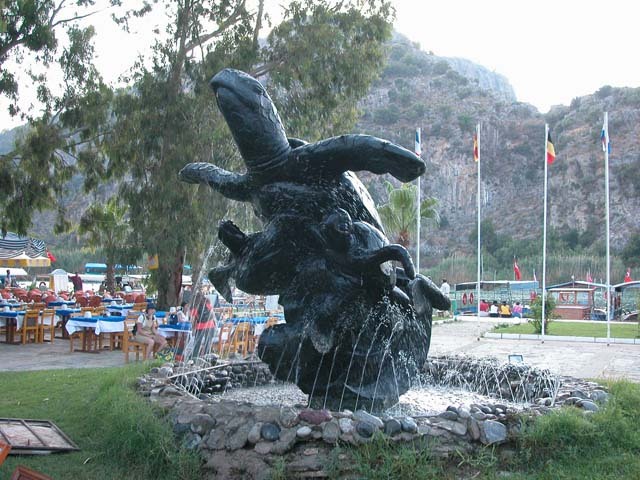 Maybe this is why so many people return to Dalyan years after year. Maybe this is why so many choose to put down roots here.